Offering you a complete choice of products which include jacketed steam cooker and jacketed steam cookers. We provide a complete Steam Cooking Solution to Food Processing Industries, Industrial Caterers, Industrial Canteens, etc. Our Steam Cooking Units are designed for best performance with the optimum use of Energy. 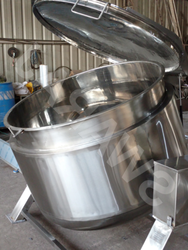 We have manufactured Jacketed Steam Cookers having different capacity. We have also manufactured Pressure Vessels with Agitator. 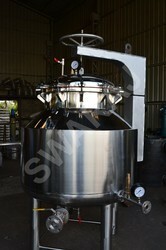 Our Vessels are manufactured from Food Grade Stainless Steel with different working pressure. Our Jacketed Steam Cookers are Hydraulically tested. We can Provide Steam Boilers - Lpg / Fire Wood / Fire Briquettes / Electrical / Diesel / Hybrid - ( Electrical Lpg) / Solar Steam Based. Looking for Jacketed Steam Cookers ?